Malnutrition is common in hospitalised patients. Adults of advanced age may also have impaired or disrupted swallowing function (dysphagia) associated with age-related physiological changes and impact of a decline in muscle mass and strength on swallowing function. As dysphagia can affect oral intake, it can further impact on the nutritional status of an individual. In this research study, a New Zealand team looked at the prevalence of nutrition risk and associated risk factors among adults of advanced age newly admitted to hospital and reported how this was associated with dysphagia risk. 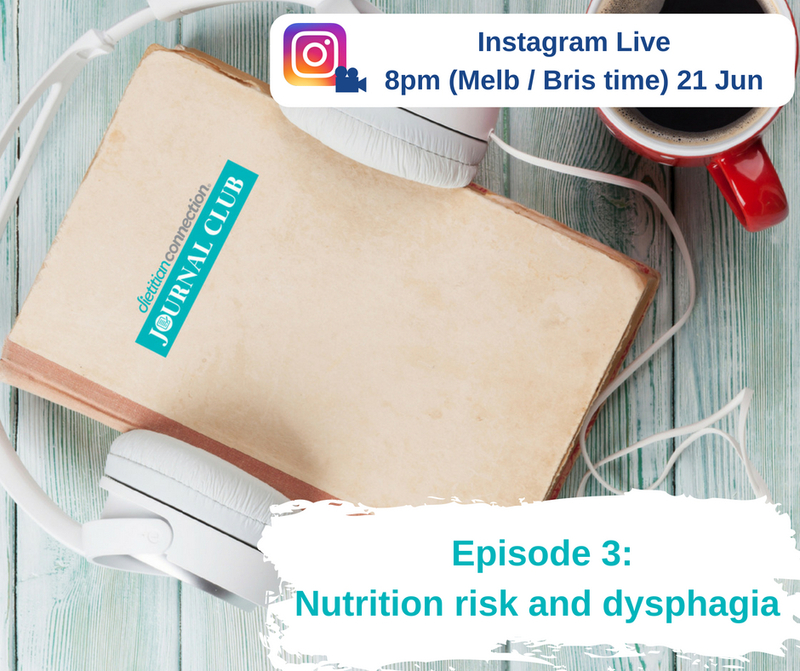 DC Journal Club will be LIVE on Instagram on 21st June at 8.00pm (Melb/Syd/Bris time). Note: Make sure your following us on Instagram so your notified when we go live. Popman A et al. High nutrition risk is associated with higher risk of dysphagia in advanced age adults newly admitted to hospital. Nutrition & Dietetics 2017;75:52-58.